Sports is the great leveler, and even the Korean peninsula is showing signs that the Olympic Winter Games in PyeongChang, South Korea, Feb. 9-25, may help more than a few people find common ground. As always, the broadcast audio for the event will play a critical role in conveying its drama and achievements. Sitting down with SVG, Karl Malone, director, sound design, NBC Sports and NBC Olympics, which will broadcast the Games live to the U.S. audience, says there’s a lot to look forward to. In what ways might the audio capture be different in PyeongChang than it was in Sochi, Russia, in 2014? Will we see microphones in places we haven’t before? NBC has worked hard on the back of our Winter Olympic Games in Sochi to improve on some of the close miking of events. We work very closely with OBS, the host broadcasters, to request from the international sports federations better access to the fields of play in order to get the best sound that we can. We have to engage with the federations to get the mic placements we need without putting any of the athletes’ performances or their health and safety in any danger. The biggest change for us is the agreement by the federations to allow microphones to be placed inside the ice rinks for hockey, figure skating, and speed skating. We had our primary NBC hockey A1 Tim Dunn test new microphones inside the glass on NHL on NBC games during 2017 and also approached an ice-rink–infrastructure company to produce a safe mount for the mics on the boards surrounding the rink. We had very successful tests during the year and provided those results to both the Olympics host broadcaster and the international federations for their review. Thankfully, the outcome was positive, and we can now bring the quality of coverage we are used to providing at home to our PyeongChang Olympic hockey and figure-skating productions. Sochi was a very interesting case in point for figure skating, as we were not permitted to [use] a close ice pickup [microphone] and instead relied more on the NBC rink-side handheld-camera mics and a direct feed of the music the athletes were performing to. The music itself can allow the beauty and grace of the performance to shine through, and, as audio mixers and designers, we need to choose in the moment how to bring that performance to the audience. Does the audience want to hear/feel the connection of the athlete to the music, hear the cleanness of the skate landing on the ice, or a creative mix of both? The audio mixer has to be also thoroughly involved in the performance to recognize and know how to present it. That is why we choose the best audio mixers and assistants who have many years of experience mixing a specific sport. Will you be able to wire athletes for sound more than in the past? Athletes are more difficult to mike, as you can imagine. In many Olympic speed sports, the aerodynamics of the athletes are of the utmost importance, and the capture of TV sounds ranks low in the big picture. It can be easier to mike the apparatus sometimes, and we are looking at experimenting with that on some of the speed events. We will continue to wire up various U.S. coaches as well as friends and family of U.S. athletes, as this can provide us with some very riveting audio for those at home who are following the life stories of athletes on their personal journeys to representing their country. How much further into IP signal transport will the production be this time? We continue to be heavy AoIP users, with the integration between our communications networks and audio-console IP modular cards making the sharing of resources much simpler. All our NBC commentary systems from all venues are transported through Cobranet, RAVENNA, or Dante and are backed up through secondary diverse-path AoIP systems outside of the NBC IP network. 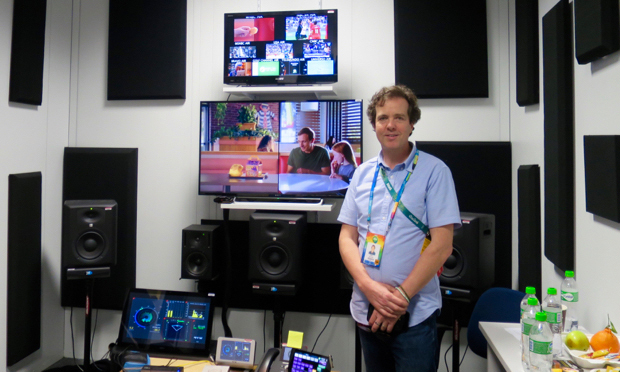 Similar to Rio, we will have a remote studio in PyeongChang, with just talent, stage manager, camera operators, and A2s onsite, whilst the production-control room will be in Stamford, CT. This time, the A1 in Stamford will be able to adjust the talents’ mix-minus auxiliary on the console in Stamford and have the change happen in Korea with zero latency, as if the studio were down the hall. The A1 will also be able to apply dynamics to the talent IFB feed. Again, all this is happening with the studio and control room being halfway round the world from each other. MADI is still a workhorse for us, always reliable and outside of potential network issues. We request microphone splits from the host via MADI and use those splits alongside our own mics to mix our U.S.-specific coverage. Our at-home off-tube announcer coverage in Stamford is fully RAVENNA and enables us to be able to have a singular commentary-control QC room, where all off-tube booths can be controlled and mixed by a single A1. A single Ethernet cable and power cable to each booth for up to three announcers is all that is required for full audio-program transmission and communications. We will always have a reporter onsite at the venues [for] our off-tube booths to interact with for live interviews and reports. Every second of competition will once again be streamed by NBC Olympics online; thus the need for off-tube announcers, which means we can, for example, cover all four sheets of curling happening at the same time without having to decide which is more important to cover live. Will IP extend more deeply in intercom and IFB as well? Without getting into specific equipment in use, we want to be able to give the A1 in Stamford who is mixing the remote studio in Korea as many in-console resources as possible: when the talent in Korea want a bit more of themselves in their own ears, the A1 in the U.S. can adjust it on his or her console and have that level adjustment happen in Korea immediately. We are not sending the talent’s own voice back to himself or herself from the U.S.; obviously, the delay would be unworkable for the talent. The A2 in Korea could also adjust that feed to the talent if required, but the communication between what the talent want in their ears has always been with the A1 in the truck — even if that truck is on a different continent — so we are trying to keep it that way. We only need an A2 onsite to assist the talent in standard studio operations. NBC is broadcasting live to all time zones. How might that affect audio? Being live across all time zones does not affect us as far as audio is concerned, but, obviously, it’s better for the viewing public to not have to wait on the West Coast for live events coming in on the East Coast. Will 5.1 surround be the default format for audio? How is stereo accomplished? Through live downmixes? NBC Sports is 5.1 across all major sports productions from Premier League to NHL, so we couldn’t consider producing anything less than what we have done for every Olympics since Beijing. Winter sports are a real favorite for NBC audio engineers, due to the acoustic properties of snow and ice as well as the dynamic nature of sports such as bobsleigh, which can be covered similar to NASCAR, with the bobsleigh approaching left to right disappearing over your right shoulder at 150 kmph [93 mph]. The effect in 5.1 is as fun to create as it is to listen to. Similarly, having the point of view of being a spectator in the finish bowl of downhill skiing and having the crowd excitement increase behind you as the skier comes over the last hill is a very immersive experience. As far as downmixing those 5.1 feeds to stereo, the most important first place to do that is in the A1 audio console. We never do separate live downmixes. Downmixes are made in the STBs and TVs in the home. Downmixes for our web content are usually made by downmix cards prior to streaming, using the same parameters we are using to monitor in our audio consoles. How extensive will Dolby Atmos implementation be in Korea for NBC? We are planning on Atmos capture and transmission for a number of high-level venues and sports, where appropriate. Our Atmos coverage in Rio was very successful, and we learned a lot about what sounded right without overly drawing too much attention to the overhead speakers. We know more now, which will help us mix these venues much more aggressively. NBC is definitely of the belief that, just like 5.1, Atmos — or 5.1+4 — is a very immersive experience which is very easy to get used to and exciting to be listening in but is very apparent when replaced with 5.1. It is very similar to when 5.1 is mixed well and A/B-ed against stereo: the image has a way of being very disappointing when [downmixed] to [fewer] speakers. The introduction of superb Atmos sound bars has [made] the Atmos experience easier to integrate into the living room.